As I look out the window, there’s no denying it any longer. The trees are bare, snowflakes are falling, and the sky has that greyish dreary hue. Winter is here. Oh sure, I know it doesn’t officially begin until late December. But here in Northeast Ohio, winter weather typically begins to rear it’s ugly head right about now. And when winter weather strikes, it’s time for winter car organization. If you experience severe winter weather where you live, then you know all too well how important it is to prepare for the worst. Creating a winter emergency car kit can literally be a life-saver. Some additional items that are crucial to have on hand in case of an emergency include a phone charger and a first aid kit. If you’re like me, these are items that you carry with you in the car year-round. I need to take my own advice and add these items to my kit over the next week! Once the car is prepped for a winter emergency, I turn my attention to making sure all of the driver creature comfort requirements are covered. 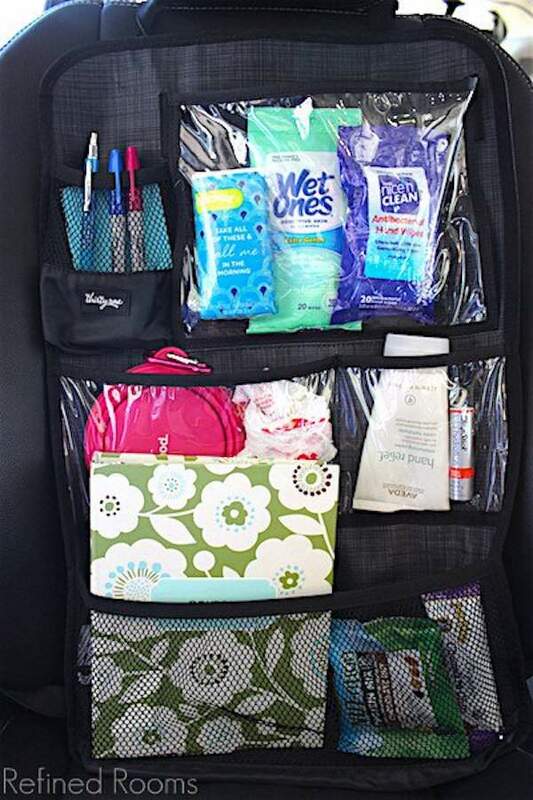 I take a bit of time to restock my car organizer that hangs on the front side of my mini-van passenger seat. In the summer, I use it to store sunscreen and insect repellent, which I swap out for hand lotion, tissues, anti-bacterial wipes and lip balm during the winter months. This organizer is also home to a few basic pet supplies (a portable water dish and some waste bags), snacks for preventing hangry episodes, pens/Post-It notes, and my trusty coupon organizer — so crucial to have on hand during the holiday shopping season. 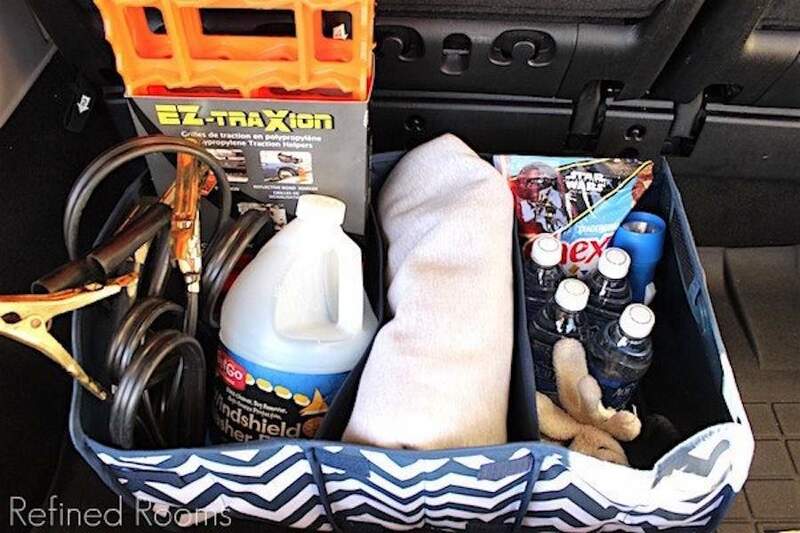 Winter car organization is one of those mini-organizing projects that you can complete relatively quickly AND it offers a huge return on your investment by giving you peace of mind throughout the coming season. You’ll know that you’re prepared for anything that Old Man Winter decides to dole out this year! Thanks for including the photos & links! Sometimes I also keep an extra set of windshield wipers in the trunk. Will get the can of Fix a Flat today! Oooh, an extra set of wipers…that’s one I’ve never thought of. Good tip Olive! I don’t generally spend much time in my car, so I’d never have thought of a few of these items, but I can definitely see how they’d be worth having on hand! Great ideas! We have a couple of these items for our travels, too. Thanks for sharing and linking up at our Tips & Tricks link Party. Wonderful list and something I should take care of immediately. I’ve got some items in the area of preparedness in the cars but, it’s most definitely not complete. Thank you for the reminder to do so 😉 Definitely pinned and thanks for sharing with us at Funtastic Friday! Thanks for pinning Angie! Yes, we’re getting warnings of a severe winter storm here as I write this. So no time like the present to get prepared!